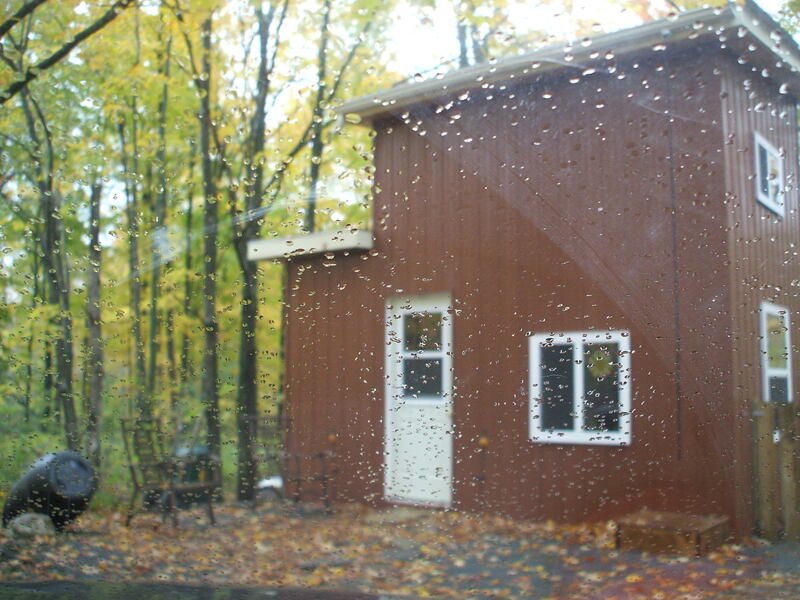 When we left Tiny House Ontario it was raining all day. We had not planned on closing up for the season quite yet, but I will not go back for a couple of weeks and it has been unseasonably cold. As a caution, I thought I better take all liquids out of the house as well as to empty the rain barrel. Simple reason, I don’t want things to be ruined by freezing nor or by freezing and thawing. The car was pretty full because of having the last chair in there already. This meant that the battery operated stuff will have to come back to Hamilton on the next trip. Flash lights, drill, radio, solar lights and battery from the bike will all come here for the winter on the next trip and after this we only get back from time to time. There is not much of 2012 left as far as THO season goes… I hate to leave there. With it raining and grey it feels like the sky is crying.